National Ice Cream Sandwich Day is celebrated every year on August 2. An ice cream sandwich is indeed a perfect treat for a hot August day. 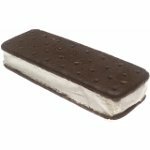 An ice cream sandwich is a type of frozen dessert which consists of a layer of ice cream sandwiched between two cookies or slices of cake. The idea of sandwiching ice cream between cookies is not new, but the first packaged ice cream sandwiches were produced in the United States in the 1920s. The modern version of this treat has been around since the 1940s. Ice cream sandwiches are known all over the world. In North America, ice cream sandwiches are typically made with vanilla ice cream (although other flavors can be used, too) and rectangular chocolate wafers. Alternatives to wafers are sometimes used such as chocolate chip cookies or oatmeal cookies. Some manufacturers produce ice cream sandwiches dipped in chocolate. To celebrate National Ice Cream Sandwich Day, make these delicious s'mores chocolate chip ice cream sandwiches for your family and friends. Spoon about 1 tsp marshmallow crème on top of a chocolate-covered graham cracker cookie. Top with about 1/2 tbs chocolate chip ice cream. Place another cookie on top and press gently. Freeze until firm.